Layer the fruit into four small glass serving dishes or martini glasses in the following order; orange, kiwifruit, strawberries and dates. 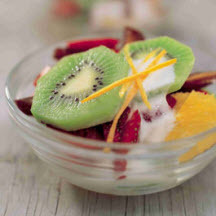 Top with yogurt and kiwifruit slices. Serve immediately.